This was a first for us, but the second year for the folks at Pon Pon Daycare to hold the annual fundraising event called Touch A Truck. And what a fun filled day it was and once again mother nature blessed us with beautiful sunny weather. The smiles were out in full force as everyone had the opportunity to take in touching, sitting in Trucks, Sports Cars, Games, Jumpy Castles and much much more. Did I mention the Glitter Tattoos too?!? We were so excited to show off this Glitter Tattoo that we custom made for this event, that we just had to make a blog entry just for it. 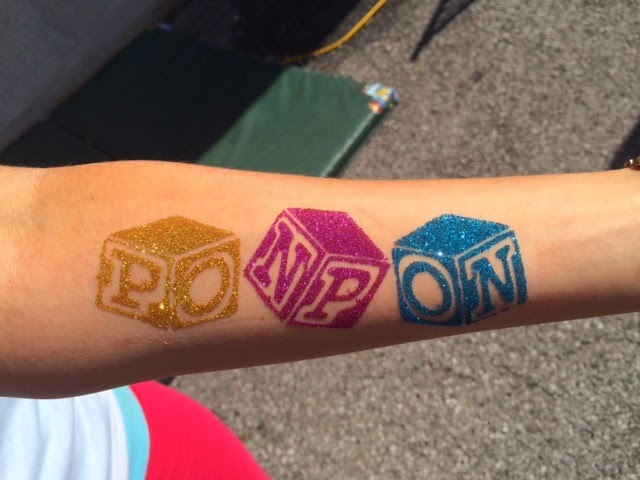 The Pon Pon Logo all done up in Glitter. If you are in the area this time next year or you have an interesting truck or vehicle that you would love to show, I am sure the fine folks at Pon Pon would love to have you join them.